For those of us old enough to remember the original Star Wars trilogy (before George Lucas fiddled with them and added ropey - even for the time - CGI effects) the Dewback was only seen briefly in the background in a couple of scenes of A New Hope. When the movie was reissued, the Dewback got a bit more screen time, but it looked incredibly poor onscreen. However, it's still a cool Star Wars creature, and so the chance to own an action figure thanks to Hasbro's Black Series will be something that collector's will be looking forward to. This figure is No. #04 in the second wave of deluxe 6-inch figure and takes its rightful place with 'First Order Special Forces TIE Fighter with First Order TIE Fighter Pilot Elite'; 'Luke Skywalker's X-34 Landspeeder with Luke Skywalker (Episode IV)'; 'Rey's Speeder (Jakku) with Rey (Scavenger)'. It comes complete with a 6" Sandtrooper, which looks almost identical to the other stormtrooper action figures that have been released, but with slightly different paint detailing. In fact one of the odd aspects of the paint work is that it has a lot of sand and dust marks scuffing up the front of the armour, but its back is almost perfectly clean. As you'd expect, the Dewback and Sandtrooper come with not only great detail, but numerous points of articulation. I was impressed that the Dewback's mouth not only opens, but that its tongue can be moved around too. It comes with a number of accessories. There's a removable saddle, a large blaster, backpack for the Sandtrooper, and prod to control the Dewback. I do have a few issues, but nothing overly bad. Firstly the Dewback looks a lot smaller than the screen version (maybe it's a young Dewback that they're breaking in) and so when the sandtrooper is sitting on it it does look a little out of proportion. 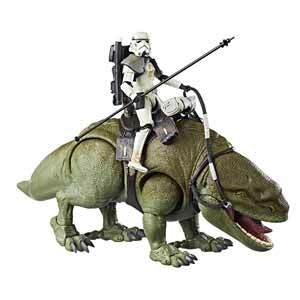 The Dewback also has a rather strange detachable saddle. I'm not sure why you can remove it. 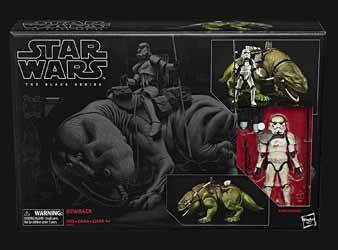 This would have been fine if without the saddle the Dewback looked normal, but it has an under saddle already sculpted onto the figure. Also it's not overly easy to fix the saddle securely in place. Maybe the saddle is the same size as others in the series and will allow you to put different saddles on it to customise your figure. This is a highly detailed and worthy addition to the series. It's certainly one collector's will be proud to own.